Pros: Good color selection, low odor, easy clean up with mineral spirits. Cons: Has a medium gloss/sheen when dry requiring careful attention to brush stroke overlap and keeping a wet edge is a must, no second coat is recommended. Very slow to dry in humid weather. Paint store color mixer leaves unmixed solids on bottom of can. My house needed to be re-stained after 10 plus years. Weathering of the cedar bevel siding was apparent with the old stain and some of the southern facing siding was all cupped and splitting. I had used Cabot’s Oil Stain in the past since the house was new, but this time I had waited too long between stainings. I called the local paint store and found that Cabot’s Stain does not make the oil based alkyd stain available any longer (at least in my state.) Going on-line to find it was too risky since the color match could prove to be a problem. Every former Cabot dealer in my area was now selling Benjamin Moore paints even though www.cabotstain.com listed them still carrying the Cabot’s brand. Not one carried it. So after researching the Benjamin Moore line, I decided that the Arborcoat classic oil semi-solid stain was the closest alkyd oil stain when compared to the Cabot’s I had previously used. It normally had taken 12 gallons to stain the entire house in the past, but I was replacing the south facing cedar siding with new rough sawn cedar siding. I needed about 900 linear feet of siding and before putting it up, I wanted to seal it on all sides. Using a roller and a brush (to back brush the stain in) I used a little under 3 gallons to seal the siding. I did it in my garage so as to keep the sun from drying it out too quickly. I noticed that after 3 days the first boards were still wet and moving them to another drying rack messed up the finish on quite a few boards. I called the BM customer support line and they told me that it takes a while to dry in hot humid weather – which it was at the time. I made a drying rack for the remainder of the boards so I could continue to stain them over the next few days batches of 25-30 boards. The weather had cooled and humidity was lower so the boards were dry to the touch overnight. The weather made a big difference just like the techs at BM said. It took another few weeks of minor repairs to the house before I tackled the siding replacement. After 3 days of hanging the new siding (from 8 to 25 feet up – not easy for one person) there was a noticeable band of lighter boards on the top third of the siding. My neighbor noticed this from his house across the street and as a joke, asked if it was planned. I knew I had to give them another coat which I had not planned, but I also needed to color the nail heads. The label on the can says not to put down a second coat. I called the techs at BM again. The first one I spoke to said there was nothing I could do about putting a second coat on except to sand off the old and start fresh. Or, put on a coat of their waterborne stain. Now I’m thinking I’ll have two different stains on the house and I didn’t like the option. I still had the entire rest of the house to stain over the old Cabot’s stain. After researching the waterborne stain option, I was somewhat confused since it seemed to conflict with the tech’s advice where I would have to remove the old Cabot’s stain and any new stain do prepare the surface. I was thinking: what happens five or so years down the road when I have to re-stain the house? Technically, that would be a ‘second coat’ and I would have to strip the house. I never had to do that with Cabot’s. I called the techs at BM again and this time his advice was to strip the new stained siding either chemically or by sanding. Well, you can’t sand rough sawn cedar and still have that rustic rough look. He agreed and said that I could chemically strip the siding with their 315 product. Spray it on, wait 30 minutes and wash it off with a pressure washer. But if the old siding was weathered enough, then it should be ok to stain over it. He also contradicted the first techs advice saying I could not put waterborne stain over the oil based stain. We spoke for a little longer and he made sure that I understood that BM could not guarantee their product if I simply re-stained over the 1st coat. I thought about this some and thought that if I stripped the whole house now then stained it, it would be the recommended procedure that BM would stand behind. But doing it preemptively seemed like a lot more cost, labor, and time. What if I took a chance and just applied a second coat? If it failed, then I could strip only the section that failed and re-stain it. This seemed like a reasonable plan to me. I had already brushed and rolled 900 feet of siding. Each time I applied the stain with the roller, there were a lot of drips because the stain is much thinner than paint. But I was working on a horizontal surface and the drips were easily handled. However, working on a vertical wall of siding would likely get pretty messy using a roller. So I thought an airless sprayer would the right way to go. 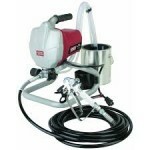 Instead of renting an airless sprayer for a week, I bought one for less than what the rental would cost (see review here). The sprayer came with a 515 spray tip which would be good for thicker latex paints, but the stain was thinner so I bought a 411 spray tip. I worked flawlessly, delivering a fan spray of 8″ which was perfect for 2 boards at a time. The local BM paint store said I would use more stain using an airless sprayer than if I just brushed. I decided that instead of the usual 12 gallons, I would buy 14 and then buy more if needed. The Arborcoat stain has a moderate sheen which I was not expecting. A low sheen or low luster finish is what I wanted, but this shiny appearance emphasized the need for being careful about leaving lap marks. Lap marks occur when the paint starts to dry before continuing on down the same board. You must keep a wet edge with this stain. I asked the Techs at BM about the sheen and they said that the sheen would gradually reduce as it weathers. My plan to use a ladder was not going to work if I had to maintain a wet edge down the length of the house. There are some sections where a siding board will run for 35 feet without interruption (like a window.) So painting a single board from end to end while keeping it wet was going to be a problem if I used a ladder. I bought this stain in single gallons because it is not available in 5 gallon pails. The first few gallons went toward sealing the new cedar siding boards. I typically stir the cans when I open them, but I had just brought it home from the paint store where they mixed it with color. I opened the can 10 minutes after buying it and with a quick stir, started staining. By the time I got the first two batches of boards sealed, I was still unaware of how thick the stain was getting. When I opened the second can the next day, I tried to stir it but could not get the stirrer through the 3/4″ thick sludge on the bottom. I fought with it for about 20 minutes before finally getting it all mixed in. I brought the third and forth gallons back to the paint store because they were the same way. The paint store clerk happily put them back into the mixer again after scoring the bottom. That mixed it all in and it stayed mixed and did not settle to the bottom again. I’m speculating that the first can’s poor mix was the reason that the top third of the siding was lighter in color. They were the first boards stained, and the last to go up. I decided to rent an Aerial Work Platform (AWP), also known as a bucket lift or cherry picker. My local hardware store had a Nifty Lift SD-50 which would work well on lawns and was drivable around the house. (See review here.) I was able to stain about 80% of the house plus trim some overhanging trees in the 2-day rental period. This helped enormously with keeping a wet edge since I could start staining 5-6 boards on one end and just move the bucket along the siding and still keep a wet edge – no matter how high up I was. If the 1st coat is absorbing unevenly a 2nd wet on wet application should be applied within 10 minutes of the application of the first coat. Do not over apply, excessive or uneven application will prolong the dry time and may result in sheen irregularity. It appears that I needed to wait and watch the absorption rate on the boards, then apply additional Arborcoat as the boards dried unevenly. This would have been a royal pain and slowed my work considerably. But I noticed it after the 10 minute waiting time – I waited overnight as a matter of fact and the stain was dry by then. Since the double coat on the new siding looked so good, I decided to give the bad areas another coat. How much worse could it be? Well, the second coat looked really nice, but it was going against all the advice from Benjamin Moore. I’ll have to revisit this post with an update after a year or until something changes. This stain is very unforgiving during application, but can look very nice if applied properly. Not being able to put a second coat means you have to put it on perfectly the first time. I’m not that good even with all the proper equipment. With factors like weathering and wood absorption rates, there is always need for reapplying. Also, there is the re-staining efforts in the future where you may have to strip the house before putting it on again. That’s something I can’t or rather, won’t commit to. I didn’t have that problem with Cabot’s Oil Stain, but it may be the result of the new VOC (Volatile Organic Compounds) laws going into effect in many states. I can’t honestly recommend this stain for siding mainly because of the second coat issue and the sheen. Stain is supposed to penetrate the wood and most stains that I’ve come across allow additional coats until the color is even. I’m guessing that Arborcoat, with its water repellent finish affects the ability to put on a second coat. It may be a good stain for decks though that benefit from a good waterproof finish. In the places where I needed to put a second coat, I’m cautiously optimistic that it won’t fail prematurely. If it does, I’ll have to strip it and re-stain it. But right now, the house looks great. Let’s see what the future brings. I just put a coat of Arborcoat oil stain (semi solid) on my completely sanded cedar shingles. Had the same results as you- lap marks, differing absorption rate, etc. I spoke with the BM guru at the local paint store and he repeated the company line – don’t recoat. It looks lousy. Any updates? am considering the arborcoat in oil-based for our cedar pergola and would be very interested to hear how it’s held up over the winter…….. Thanks for the question John. I am pleased with the performance of the stain after nearly a year. The color still looks good. The gloss has faded only a little so I think it is important to apply it as defect free as possible. By defect free, I mean keeping a wet edge and uniform thickness so you get no lap lines which is tough on large areas. 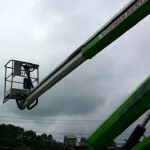 On some of the larger areas, I was fortunate in that I invested in a all-terrain platform lift and an airless sprayer. Even though I still had to back-brush, I was able to keep a wet edge and move the lift far enough away to get the big picture view to assess even coverage, then get back to paint over the still wet areas that needed it. I couldn’t have done this with a ladder. Stay out of the sun to give you the best wet edge keeping properties. I tackled my south faces in the early morning and moved to the north faces in the afternoon. East and west faces are obviously evening and mornings respectively. One slight disappointment however is that the coating feels/looks thick, sort of plastic coated which is very unlike the semi solid stains of the past. So if you don’t mind that look, go for it. I guess it’s a trade-off for (hopefully) getting a more durable and long lasting finish. Question: im using Arborcoat, semi translucent oil stain on my 1 yr old brown pressure treated deck. Ive been told that one coat is good enough, i believe two coats may be better. What is the best way to apply? One coat, then let it dry completely before applying second coat? Or, apply 5 or so mins after first coat? It almost seems if i wait till the deck is completely dry, i get a better finish on the boards… what would bevthe perferred meathod for long lasting deck boards? Suggestions? Hi. I generally find that the customer support hotline can answer questions like this. Find it on the can and on the website. Used translucent oil base Arborcoat on my new cedar deck and screened in porch. The interior is still great, but the outside deck peeled and faded in just over one year. Have sanded the entire deck and am recoating. If this doesn’t work, then am going back to Australian timber oil, which I have had great luck with. The honey teak is almost a perfect color match. Hi – we used the BM Arborcoat translucent stain in cedar tone. Had a really tough time avoiding lap marks and the stain color looks very orange and has a sheen. The color doesn’t look natural and looks very bright orange when the sun is on it it – I’m very disappointed. Is there anything I can do to tone down the bright orange (it almost looks like fluorescent orange in places. We sanded the wood before staining). Thank you. Hi Lizzy. Sorry, I have no idea but the Benjamin Moore support folks could probably tell you if there is anything to be done about the sheen and orange color. I think their number is both on the can and on their web site. Great article, … knowing about the sheen aspect, not the product wanted, you just saved a lot of time and effort. Thank you so much for your review. I kind of felt like we were kindred spirits after reading the first section of your review, lol. I’m in the middle of doing the first side of my house and I’m using BM semi solid classic oil finish stain. I had originally used Cabots bleaching stain on my then new cedar shingles back in 2000. Big mistake. The gray looked fantastic but over the years the bleaching and the weathering took its toll. The result was a thin rotting outer layer, soft from water damage and speckled with black mildew. This isn’t my first rodeo when it comes to staining wood. It is paramount that the outer gray layer be sanded off to maximize the adherence of the new stain. BTW, the house is 30′ by 32′ and two storeys high. Much work ahead. I’m using three types of sanders; belt, orbital and B&D mouse (for those tight corners). I’m removing about 90% of the gray, paying close attention to any obvious deeper surface rot. I then wipe down a section of wall with a dry cloth and also slap the wall with the cloth to remove sawdust from the gap between shingles. The very helpful salesperson at BM suggested I do two coats, staining a section at a time so as to get the second coat on within 10 minutes of the first. (I’m using a dark stain and was concerned about the yellow cedar color showing thru.) I test stained a small section on an inconspicuous part of the house and discovered that yes indeed I would need two coats. The application instructions on the can are clear about getting a second coat on within 10 minutes. Very important to have wet on wet adhesion. My advice is to get that second coat on without hesitation. The less brush strokes you use the better else you risk diluting the first coat. I apply the stain first sideways then up and down. I don’t worry too much about the drips and just brush them into the shingles. Again I’m using a dark paint and coverage is very good. I had zero issues with overlaps showing thru. I highly recommend taking the time to apply two coats. The beauty of the oil finish type stain is that there’s no priming involved and virtually no wait period to get the second coat on. Also, no going back to reposition ladders and the like.